I'm stupid but not THAT stupid. Look at the proper way in which Kitty holds her markers. Clearly an advanced child, no? Actually, no is correct. The kid has a promising career as a tagger. Despite our constant reminders to "write only on paper" she tries her level best to mark walls, furnishings and the faces of those holding her. We outsmarted her though and went ahead and paid the extra dosh for Crayola Wonder markers which ONLY mark on Color Wonder paper. Score one for better living through technology there. 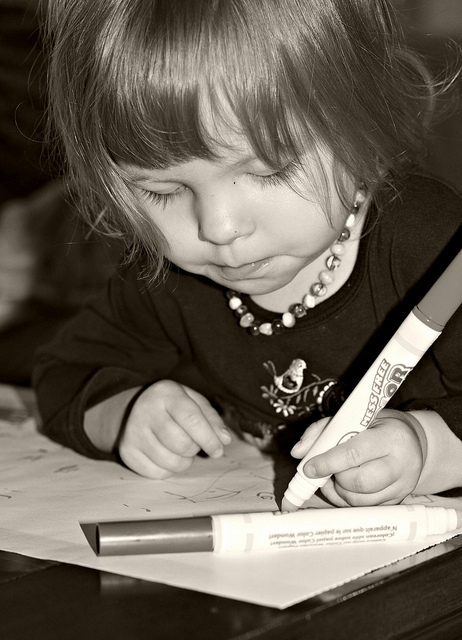 Buoyed by her outstandingly advanced penmanship (she's great at drawing circles. But that's her entire repertoire) and her keen interest in toilets I thought it might be time to do a lackadaisacal bit of potty training. I figure since she still doesn't sleep through the night I am due for some easy with this kid and maybe easy and early potty training might be in our future. So we decided to buy a very simple, small and easily portable potty and see if she warms up to the idea of using it. After being agast at all the potties on the market with bells, whistles, flashing lights and canned thunderous applause I finally located a suitably simple potty and discovered that the closest retailer was Babies R Us. So off we went to make the purchase. As the woman at the till rang my order up she said "This purchase qualifies for our buyer protection plan. Would you like to purchase a buyers protection plan?" I'm sure I looked at her as if she had an alien baby hatching out of her skull. "A warranty? For a plastic potty? Are you serious?!?!" To which she replied "Well it covers you for accidental damage." Now the American tendency to over consumerize everything always rankles me but this to me was the height of STOOPID. An extended warranty for a $20 plastic potty. I wonder how many people actually pay for it? I wonder how many other countries have such stupid grabs for extra cash by retailers? I told the woman I would be interested in a warranty only if it guaranteed my kid would use the potty. She did not think I was funny. We gathered at my cousins home in Seabrook for Thanksgiving. If any place feels like my home town, its Seabrook. My mom grew up there. My grandparents lived there and I spent summers, weekends etc in Seabrook. I was born here. Now uncles, cousins and friends are all in the area. My grandparents are buried here. As a kid we moved around to follow my dad's career and Seabrook was always there, waiting for us to come home. It was so nice to spend the holiday surrounded by family and friends in the closest thing to a home town I've ever had. 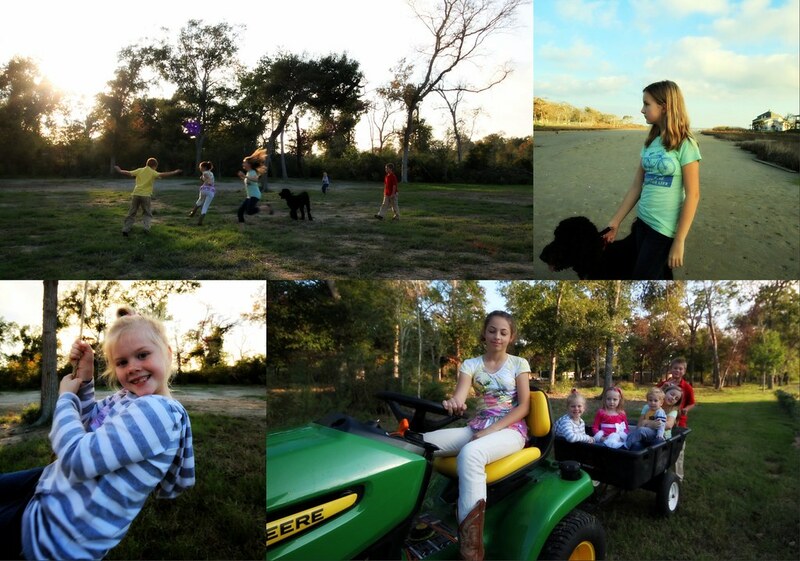 Our Thanksgiving was filled with turkey and tractor rides. A tribe of cousins playing touch football and seeing how high you could swing on the tree swing. Loud, raucous kids running along the bay at low tide with Luke the dog trying to herd them all. It was baby wrangling and the big girls first ride on a Harley. Poking jelly fish with sticks and climbing trees. Aside from my brothers not being able to attend, it was perfect. Old Perky, originally uploaded by CidnieC. So you are wondering why I have a shot of the upper part of Old Perky? Its not Perky you should be looking at, its the overall brightness of the engine compartment. Since we had to start the rewiring from the engine and work outwards, it meant we could wire in anything we would like. 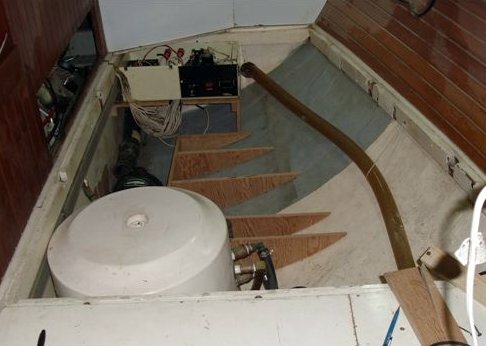 What we would like is light in those dark nooks and crannies of the boat. So the engine compartment now has fluorescent lights wired in and mounted up out of the way. We plan on wiring in additional lights into all of the storage compartments that have enough space to tuck a light up out of the way. This might seem like a silly thing but being able to actually see into the dark crevices of the boat without a head lamp is a pretty sweet deal. Kitty now knows the drill when our UPS guy rings the bell. She runs along on her tiny feet saying "Dada's box!" and since 99% of the time it is a box from Defender, she's usually correct. 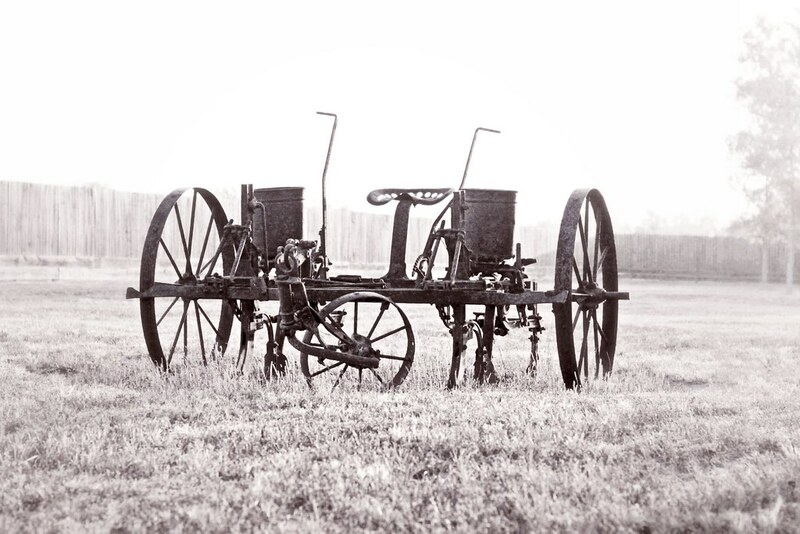 What does a photo of an old piece of farm equipment have to do with boats? Not a lot but it does speak to the fact that I've been running in 14 different directions and photography has been sadly neglected due to the many hats I am wearing just now so I pulled up an old photo I did. 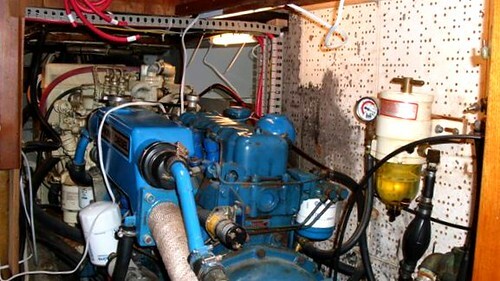 I like old machinery and since this post is about old machinery- namely our Perkins 4.108 engine on the boat is sort of fits if you are willing to really, really stretch your imagination. When we run into a new problem on the refit we like to think of it as "a challenge and opportunity". Ok, we call it that after a bit of creative profanity but eventually we get there. While doing the rewiring it became clear that the wiring harness to the engine itself needed to be redone which meant we are getting up close and personal with Old Perky. Yes, we have a manual but for some reason the manual likes to omit helpful bits of information. Information like the fact that the Perkins 4.108 does not in fact use standard glow plugs but instead has a thermostart. Maybe this is old news to you but it was new to us and a EUREKA! moment. So that's why Old Perky was getting fussy on cold mornings. The thermostart is getting a bit of love courtesy of parts from Parts 4 Engines. We do think its funny that to order parts made in the US we have to order from the UK but Mark was very impressed by the kowledge of the person he spoke with at Parts 4 Engines. They did not have all the parts we needed but they knew exactly what he was talking about which is a big step ahead of the other chandlers we contacted who when asked about particular parts could only answer with "A what?". So there ya go. Now you can never say we never shared anything useful on the blog. Now if you are a bear of little brain like us who isn't sure what ignition system your Perkins 4.108 has you know and more importanly you know a good, knowledgable parts supplier to get all those mystery widgets from. You know how people shudder at the thought of redesigning and rewiring the electrical system their boats from start to finish because it is a mind numbing exercise in tedium? Turns out writing about rewiring and redesigning electrical systems is exactly as scintillating as actually doing it. Now you understand why I've been quiet and you will understand why the next few posts might fall more into the "life" category as opposed to "boat life". Never fear, once Mark finishes it I will do a long, lengthy step by step outline of what was done, what was changed and how it was accomplished. With the boat in huge disarray, we are definitely taking a 'divide and conquer' approach. This means I keep the kids busy on land while Mark works on the boat. 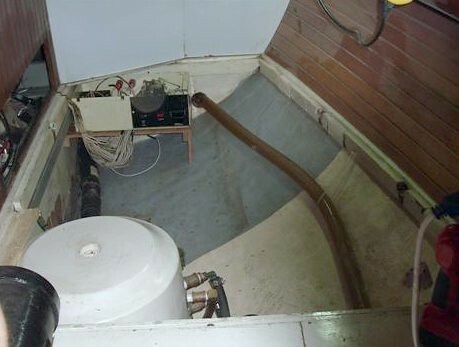 With the companionway steps out to provide access to the engine, wires and tools laying about it makes sense to keep the kids away but I'll admit that sometimes its tough to feel so removed from the hands on work. It can be easy to forget that while keeping the kids happy and engaged might not be as immediately satisfying as tackling a project and checking it off the list, it is a very important part of the getting us off the dock process. Don't get me wrong, I adore being with my kids its just that sometimes it feels as if I'm not really helping us to get to the big goal of getting the boat ready to go. With all the toddler wrangling, big girl school activities and non-stop boat projects sometimes it feel like we don't get a lot of time to just hang out. I treasure our weekend mornings. Before work begins on boat projects, its time for coffee and toast and hanging out with the kids for a few hours. 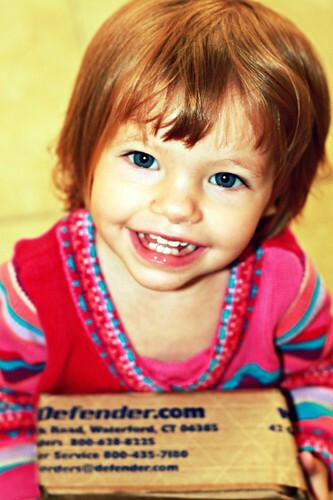 We are all really enjoying Kitty just now- its so much fun to hear her trying out new words (elephant and alligator are her current faves) and watching Maura and Kitty really beginning to play together. Just the best kids ever. Its a good reminder of why we are doing all this work to be able to spend time together. We now have a safe, secure and tidy home for the battery bank. 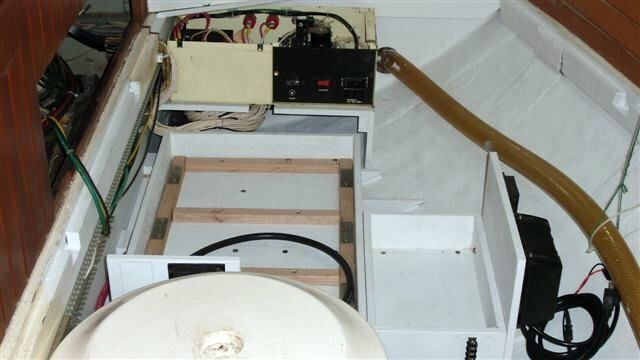 Mark built and installed the ribs in order to get the batteries up off the curved bottom of the hull. He then built trays out of hardwood, painted them and installed them with stainless steel brackets. 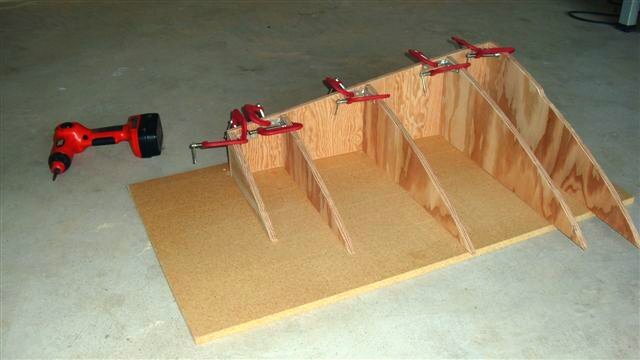 He's made a hardwood frame with stainless steel brackets to fit on top so the batteries will be well secured. This being a Captain Perfecto project, it has of course spawned two additional projects. The water heater in the forward left of the photo is according to Mark "looking tired" so of course he is now going to replace it. That wasn't on the list but if I comment on that fact I will only be stealing his joy. There is nothing worse than stealing another person's joy so I will just say "okay", hide my fear of never leaving the docks because the boat is never finished and start researching water heaters. The other project was on the list but it has moved to the front of Mark's mind. The hose on the right of the photos is the rear head discharge line. It will be replumbed to discharge to a through hull right behind the head eliminating the run of hose through the battery compartment. Meanwhile, old copper wiring is being replaced by tinned wiring. So what camp are we in- solder or crimp? Both. Mark is adamant that all wires must be crimped and soldered. I had a good friend who disagrees with this as "you don't want to solder anything that moves". Mark's take is that if the wiring is moving he's done it wrong. Since electrical stuff is Mark's forte, we'll just go with it.